GrabCAD Print Advanced FDM Software designed to eliminate CAD-to-STL roadblock, streamlining workflow, production times, material usage – aimed at speeding time-to-market and revenue. Empowering designers and engineers to embrace new 3D printed possibilities, Stratasys (NASDAQ: SSYS) is further removing complexity from design-to-3D print processes. 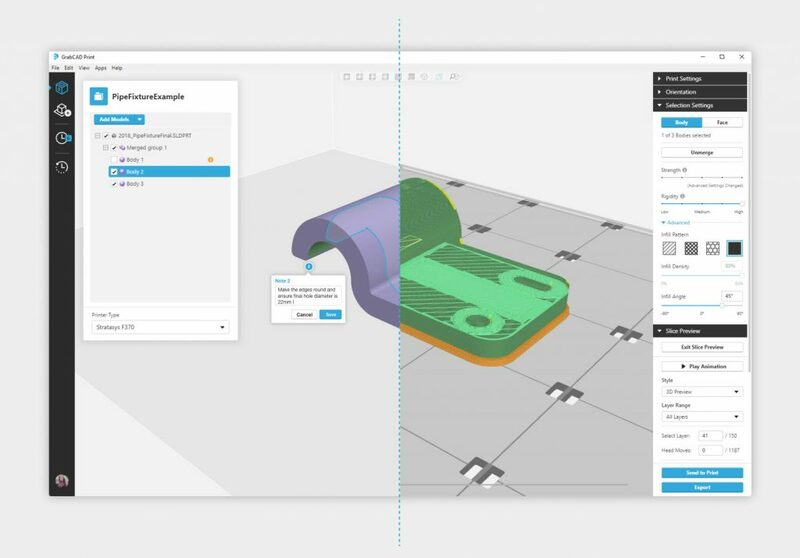 GrabCAD Print’s Advanced FDM feature is aimed at ensuring design intent via intuitive model interaction to rapidly deliver strong, light, and purpose-built parts. “For design and manufacturing engineers, one of the most frustrating processes is ‘dumbing down’ a CAD file to STL format – only to require subsequent re-injection of design intent into the STL printing process,” said Mark Walker, Lead Software Product Manager at Stratasys. GrabCAD’s Advanced FDM is available now via download with GrabCAD Print (from versions 1.24) and is supported on the following Stratasys 3D printing systems: Stratasys F370, Fortus 380mc and 380mc Carbon Fiber, Fortus 450mc, Fortus 400mc, Fortus 900mc, and Stratays F900.